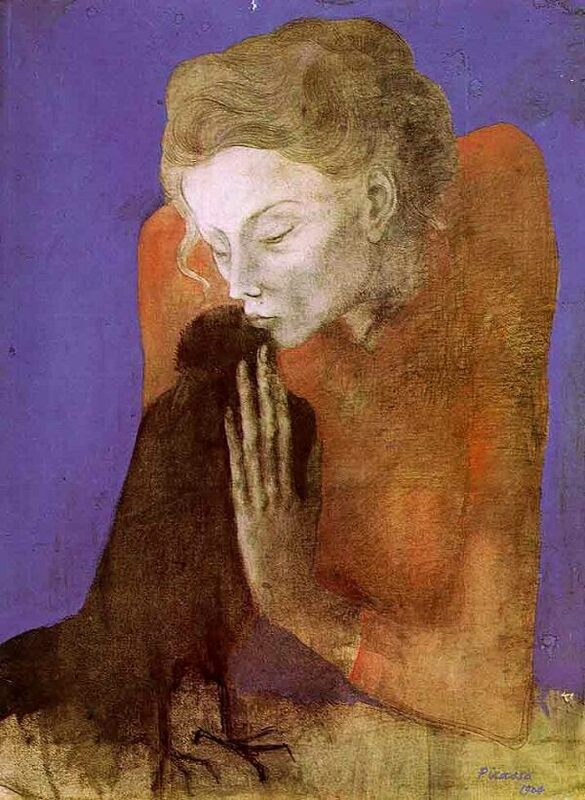 Woman with a Crow was produced towards the end of Picasso's 'blue period'. Here the blue tonality that had recently dominated Picasso's work is largely restricted to the rich, blue background that gives this work on eerie, nocturnal mood. The figure itself is represented in more naturalistic colours, though only loosely sketched in. The subject exudes mystery. A young woman kisses and gently caresses a crow - possibly a literary reference to the mysteries of Edgar Allan Poe (1809-49) - in a gesture of such tenderness that we sense a mood of loss or reverie. Here Picasso used gouache and pastel on paper, applying thin washes of pale colour over the more linear treatment of the hair, face and hand of the woman. This gives the figure a ghost-like ethereality, as if she might simply evaporate In the bottom half of the work, the figure seems to dematerialize, her body becoming one with the foreground space. The severe attenuation of the fingers ond the profile of the hunched and bony shoulders also imply a frail physique and thus the overall mood of fragility is reinforced.